"Profile - Default editor to use"
Ensure consistency on the locations that mention the WYSIWYG editor, at least the ones from the description. Familiarize yourself with XWiki by downloading and installing the latest version. You should be familiar with using Git locally or you might be able to commit your changes from the GitHub interface. 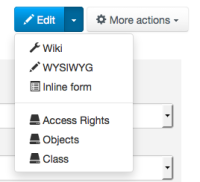 Get familiar with XWiki's Localization features and make sure to go through the Translations Tutorial .